Brand Autopsy | Why is a Brand Style Guide important? Proper logo usage is a must for businesses of all sizes. A Brand Style Guide is important for businesses of all sizes. It’s a must have when working with outside vendors and with departments inside a company to ensure everyone is using the company’s logo in a consistent and correct manner. The size of your business will determine the level of detail needed in a Brand Style Guide. Small businesses need less detailed style guides while big businesses need more detailed style guides. At the most basic level, a Brand Style Guide is simply a reference sheet that explains the proper visual usage of a company’s logo, colors, and tagline. It should include examples of how the logo should look in all types of situations from color to black & white to print ads to menus to business cards to t-shirts to anything where the company’s logo can appear. It should also include examples of incorrect logo visuals to better highlight the correct usage of the logo. Additionally, the Pantone color code (PMS #) should be listed for all colors used in the logo and the font name should be listed. Every small business should have a reference sheet that lists proper logo usage, incorrect logo usage, exact logo colors (PMS #), and anything else someone must know to reproduce the logo so it looks perfect. When working with vendors like Fast Signs, FedEx Office, or a local print shop, it’s imperative to show them EXACTLY how the logo should look. This will help reduce any mistakes a vendor could make in using your logo. 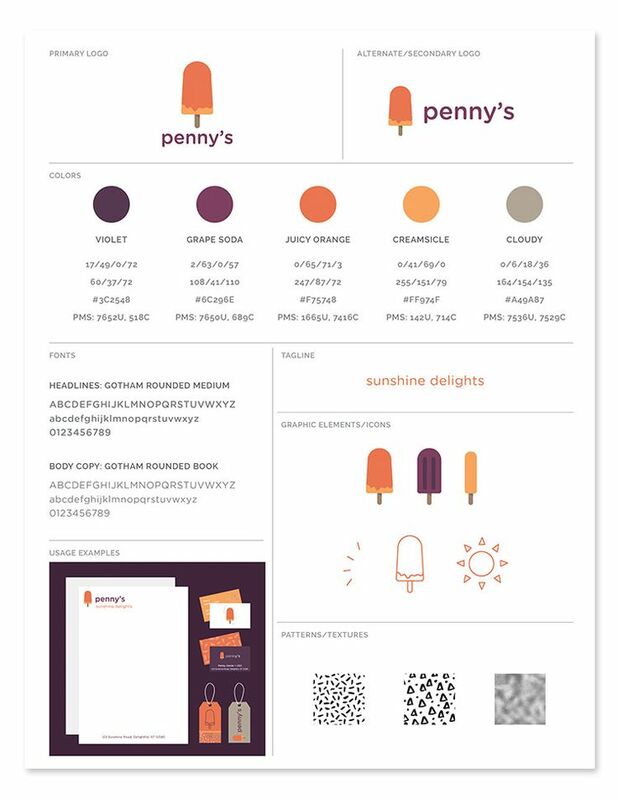 Penny’s is a mom and pop popsicle shop and their one-page Brand Style Guide does the trick. 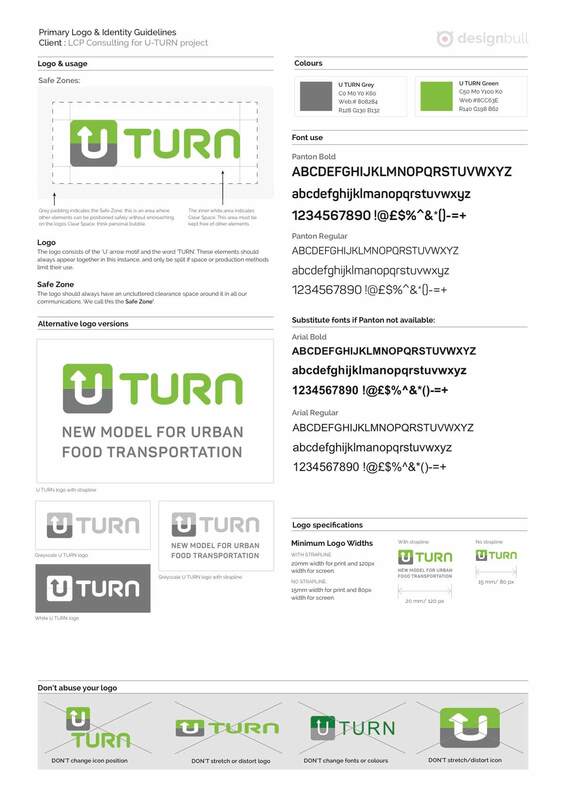 U-Turn is a transportation startup concept and they use a very basic Brand Style Guide. 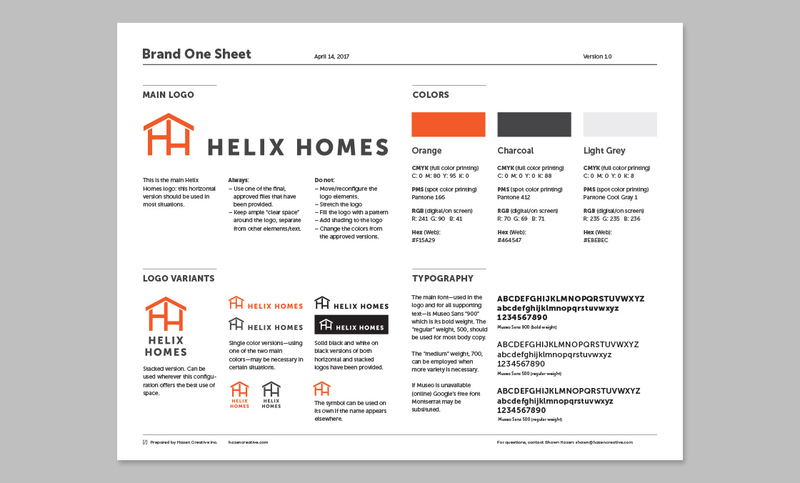 Also, Helix Home is a luxury homebuilder with a simple and classy Brand Style Guide. For big businesses with several departments and multiple offices, a Brand Style Guide takes on a greater role. Yes, this guide should include how to use the logo, but it should also include more specifics on typography, color, sizing, imagery, etc. This guide should also contain information about the company, it’s vision, it’s purpose, and it’s brand. In large companies, a Brand Style Guide serves as the “brand bible” for how the company should behave (attitude and actions) and look (visually and legally). This provides instructions to internal departments and external vendors to follow. For example, United Way uses a Brand Style Guide that explains what they stand for and then goes into great detail to show correct uses of its logo, incorrect uses, proper treatment of its tagline, exact color specs, and many more details. A Brand Style Guide can also serve as a “brand bible” if you are smaller business with bigger aspirations. Honor Coffee & Tea is a relatively small business with a handful of locations in Seattle. Their Brand Style Guide includes the basics of how to use their logo but the company also goes into great detail to explain its ethos, beliefs and aesthetics. No matter the size of a business, it’s important to be consistent in how the logo is used in any way imaginable. A consistent looking logo tells customers you care about details and isn’t that what customers want… a business that cares about the details. #08 | Are Logos Important? Why or Why Not? #09 | Can a Brand be Built without a Large Budget? #10 | Why is a Brand Style Guide important?